A dermatome is defined as ‘a strip of skin that is innervated by a single spinal nerve‘. They are of great diagnostic importance, as they allow the clinician to determine whether there is damage to the spinal cord, and to estimate the extent of a spinal injury if there is one present. In this article, we shall look at the embryonic origins of dermatomes, and explore their clinical uses. We can trace back the origins of dermatomes to the 3rd week of embryogenesis. At around day 20, the tri-laminar disc has been established and the middle layer (mesoderm) has differentiated into its different types. The portion that is directly adjacent to the neural tube is called paraxial mesoderm. From day 20 onwards the paraxial mesoderm differentiates into segments called somites. 44 pairs of somites are formed, but 13 of these break down leaving 31 somites. This corresponds to the 31 sets of spinal nerves in the body. The somites themselves are comprised of a ventral and a dorsal portion. The ventral portion consists of sclerotome, the precursor to the ribs and vertebral column. The dorsal portion consists of dermomyotome. Over time, the myotome proliferates and the dermatome disperses to form dermis. 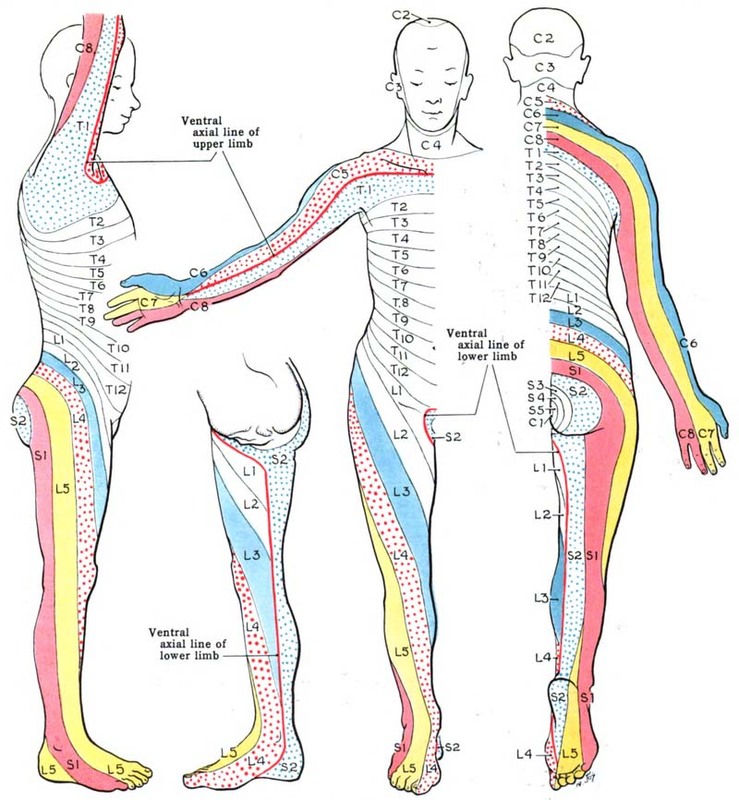 As the limbs grow, the dermis associated with the precursor of the limbs is stretched and moved down the limb, creating the segmental innervation that is associated with the Keegan and Garrett dermatome map of 1948. There are two main maps that are accepted by the medical profession. The first is the Keegan and Garret map of 1948. This depicts dermatomes in a way that correlates with the segmental progression of limb development. The second is the Foerster map of 1933 which depicts the medial part of the upper limb as being innervated by T1-T3 which follows the distribution of pain from angina or an MI. 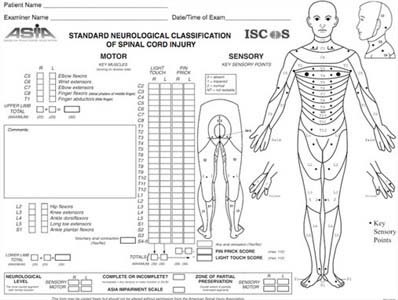 This is the most commonly used map, and features in the ASIA scale of assessing spinal injury. Both maps depict progression of limb growth around an axial line. Across this line there is no overlap between dermatomes, but often those adjacent each other have a slight overlap. Fig 1.1 – The Keegan and Garrett dermatomal distribution. Fig 1.2 – The ASIA scale. It used to assess patients with a potential spinal nerve lesion. Following a traumatic injury that may involve the spinal cord, the clinician can test dermatomes to determine the presence and the extent of a spinal cord lesion. Firstly, the clinician uses cotton wool to test for light touch sensation along the limbs and torso, touching areas which correspond to the different dermatomes. Secondly the clinician uses a small pin to test for responsiveness to pain. The patient is instructed to close their eyes and say when they feel contact with their skin (Light touch and pain are tested separately as their fibres travel in different parts of the spinal cord – see here). By using their knowledge of dermatomal and peripheral cutaneous innervation, and noting any regions of paresthesia, the clinician is able to ascertain whether there is any nerve involvement. Also, they can determine whether this is at the spinal root or peripheral nerve level. Somites are formed from which precursor mesoderm? By which point of embryogenesis is the tri-lamiar disc established?